Welcome to the world of fast food, flipping burgers, frying chicken, serving pizzas & making terrible coffee. Let me hear you say "Would you like fries with that ?" Your job is simply serving food in a popular fast food restaurant, think you're over qualified ? No, its not rocket science, its harder then that! You're against the clock and have to serve customers as quickly as possible. However if you select the wrong order then its coming out of your pay! You'll need nimble finger, quick reactions and don't even bother trying the hard level unless you qualified in the top 10% of your class! 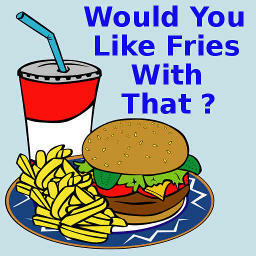 So download "Would you like fries with that" and take it away now.